The New Horizons probe is the first mission in the NASA New Frontiers planetary exploration programme, which is to carry out the first scientific reconnaissance of the Pluto/Charon system. Pluto is dwarf planet called a plutoid with a diameter of about 2374 km and a mean surface temperature of -220°C. One day on Pluto is nearly an Earth week. The diameter of Charon is estimated to be between 800 and 1200 km. With a mass of around 465 kg, it is carrying several scientific instruments including infrared and ultraviolet spectrometers, a colour and panchromatic imaging device and other instruments capable of measuring charged particles and surrounding dust. After several postponements, it was at 19h00 (GMT) on 19 January 2006 that the Atlas V rocket successfully took off from its launch pad at the Kennedy Space Center in Florida. New Horizons is now on its way to Pluto! The probe flew by Jupiter on 28 February 2007 at a distance of about 32 to 45 Jupiter radii, using gravity assist from the planet. Measurements and photographs of the Jupiter system were taken. The probe's trajectory was then modified and it is heading for Pluto, which it will fly by at a distance of 10,000 km. The encounter is planned for July 2015. Its satellite will be flown over at about 27,000 km. The probe will not orbit the two bodies as a satellite. 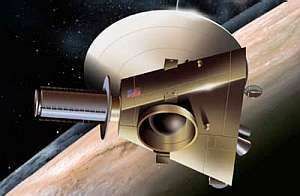 New Horizon, the first mission to Pluto.